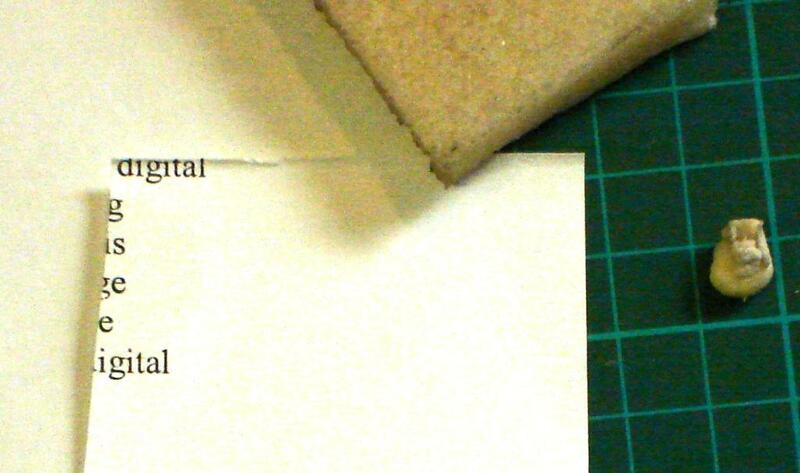 Conservation Q&A: Can you give info on removing chewing gum on reverse side of an important document? There is a small quantity of gum still in place – fairly fresh, a circle of about 1/2 inch. Some stain has bled thru to front. What is a safe cleaner? Or is this a job for a conservator/archivist? As there is already a certain amount of staining, especially with coming through to the image side, you will have to see a paper conservator for solvent treatment on the stain. Depending upon the type of paper and the type of gum, nevertheless, you may be able to successfully remove the residue yourself. We tried out a couple of methods to remove the gum manually. The paper we used was a smooth photocopy paper. Using a Staedtler Mars plastic eraser (the image shows a crepe rubber which was equally efficient), and gently working from the outside of the area affected to the inside you can roll the gum into little balls that can be removed. Keep gently working, it can take a few minutes. A crepe rubber also successfully removed the surface residue. 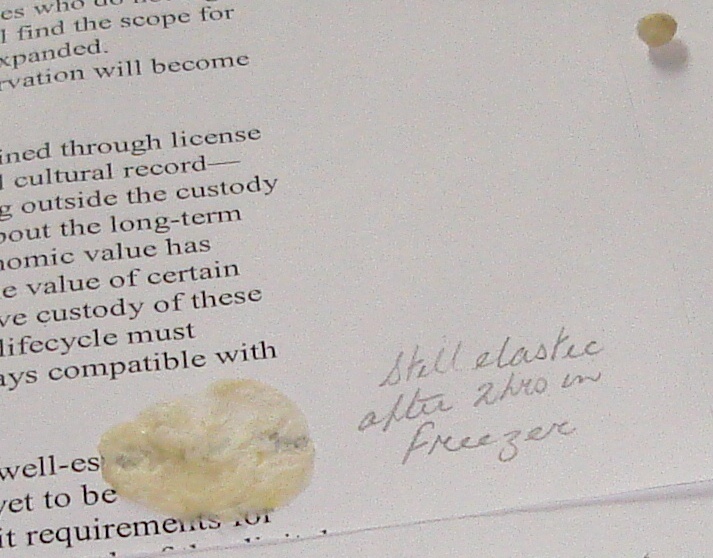 If your document has a fairly rough surface, you may find this is unwise to try as you could disturb the surface. In this instance a paper conservator would have to try removing both the residue and stain with solvents. There are also a few references about removing chewing gum in the literature but mainly with reference to leather or carpets. The general approach is to chill or freeze the gum. This renders it hard and brittle so it will pop off. A suggestion came from the preservation department at an American university where they have successfully removed gum from the pages of library books. The book was placed in a ziplock bag, made airtight, and placed in the freezer until the gum was frozen solid and released itself. This may work with your document but the problem with condensation forming and possibly affecting any fugitive media, (felt tip pens marks or fountain pen ink), is an issue. Often freezing is carried out for the killing of pests, in these cases the box or item is wrapped in paper and then again in plastic expelling as much air as possible. 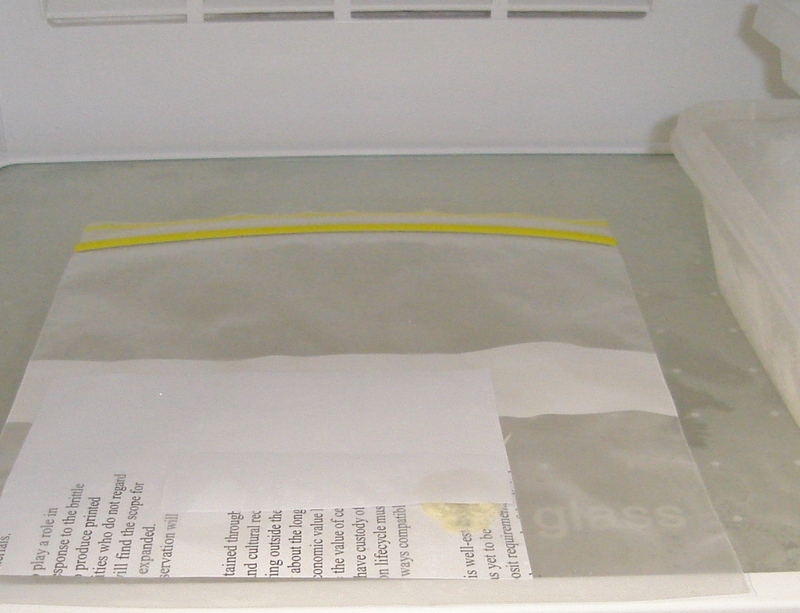 After freezing, it is left to come up to room temperature before opening, the wrapping having protected against condensation forming on the object. In your case, the gum residue may well not come off if returned to equilibrium, and its sticky state. the gum still seemed soft after four hours. Research is continuing! The chewing gum used was Wrigleys (Sugar free), does this explain why it remained elastic? Experiments using bubblegum and other brands may yield different results. Update: The gum was still sticky after a week in a domestic freezer. This 1862 petition was initiated in protest to the sentencing of William Spicer who was convicted for his involvement in rioting against the Chinese community at Lambing Flats gold fields in 1861. The individual collated sheets of signatures were pasted together, 2 abreast and then end to end to form a single 13 metre long document. For storage, the petition was folded in half lengthways, and then compactly rolled over and over. The problem for anyone who wanted to read the document was that in order to open up the petition, the entire length needed to be unrolled first.